Bravil Mages Guild is found near the north end of the southernmost bridge, on the west side of town. Bravil's Mages Guild specializes in Illusion magic. The building is divided into the Bravil Mages Guild, the Bravil Mages Guild 2nd Floor, Bravil Mages Guild 3rd Floor, and Bravil Mages Guild Basement. 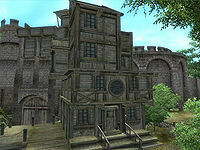 The Bravil Mages Guild is one of the few buildings that has an inaccuracy regarding the windows on the building. On the outside it clearly has four floors, but only three are accessible in-game. The front door leads to a room where Ardaline, Aryarie, Delphine Jend, and Kud-Ei can often be found. A door leads to the basement, and a staircase in the south corner leads to a door to the second floor. In the dark corner beside the stairs sit two clutter crates, three clutter sacks, a clutter barrel, and a bookshelf that holds a silver dagger. A counter with two compartments beside the basement door holds assorted alchemy apparatus. 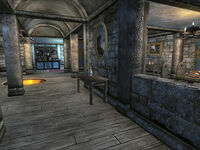 A small room in the eastern corner holds nine bottles of cheap wine in a wine rack as well as a bottle of mead and a cheese wedge on top of it. A cupboard holds dishes inside and three ears of corn, two pieces of venison, and a pumpkin on the shelves. Two clutter crates sit in the corner with two clutter sacks beside them. A dinner table in the room in the north corner holds a carrot, two cheese wedges, an ear of corn, a potato, two strawberries, two tomatoes, and a bottle of cheap wine. The bookshelf in the corner holds a mortar and pestle. In the room across from the front door, the bookshelf holds an alembic, three retorts, a calcinator, three mortar and pestles, a lesser soul gem, and three weak poisons - one Damage Willpower, one Damage Personality, and one Damage Intelligence. The ledge on the wall holds another alembic and a petty soul gem. The counter in the middle with three compartments holds more apparatus and on top sit a calcinator, a lesser soul gem, and a lectern with clutter. All of the containers here respawn. 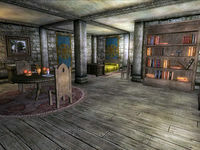 The 2nd floor is the living quarters with four bedrooms and five single beds, all of which can be used by any Mages Guild member. The room across from the entrance is a bedroom with a single bed, a clutter desk, a set of shelves that holds food, a clutter cupboard, and two clutter barrels, all of which respawn. The chest next to the wall tapestry, which can contain gold, jewelry, and/or clutter, does not respawn and so is safe for storage. A table also holds two apples and three radishes. The hallway to the right upon entering has two doors on the right leading to bedrooms. The first holds a single bed, a food cupboard, and a clutter barrel. The second holds a single bed and a cupboard that contains drinks. The room at the end of the hall has two beds, a drinks cupboard, seven clutter barrels, and a table with three leeks, two apples, and a loaf of bread. Three clutter barrels sit beside the staircase in the hall which leads to the third floor. All of the containers in these rooms respawn. The third floor is a single room with a table that holds two apples and two tomatoes. The double bed can be used by anyone and has a chest of drawers that contains clothing at the foot, and another beside it. A novice mortar and pestle and calcinator can be found on the bookshelf, which also holds a copy of the Destruction skill book The Horrors of Castle Xyr. Another chest of drawers with clothing in it sits on the southeast wall, with a green silk garment on top and a pair of gold trimmed shoes on the floor beside it. A clutter cupboard sits in the east corner. The chest near the bookcase, which may contain gold, jewelry, and/or clutter, is the only container in this room that does not respawn. The basement consists of a single large room. Ita Rienus can often be found here. A clutter chest sits in the south corner. A cupboard containing clutter sits in the middle of the northeast wall. In the north corner are three clutter barrels, and another three are between the columns in the middle of the room along with a clutter chest. The two clutter sacks and the grain sack at the foot of the staircase do not respawn, and neither does the leveled weapons and armor chest in the north corner, but every other container in the basement does. On the 2nd, 3rd, 16th and 17th of each month, Carandial can be found in and around Anutwyll, instead of visiting the Mages Guild. Henantier will not visit the Mages Guild prior to the completion of Through a Nightmare, Darkly, and Kud-Ei is away during the same quest. Esta página foi modificada pela última vez à(s) 19h59min de 9 de junho de 2013.